A fun way to pay for things and to get paid. Dogecoin makes the Internet a lot more fun. You can give people tips, or receive tips. You can pay for products, or get paid. Think of it as the most fun you will ever have online paying and getting paid. People even give away Dogecoins for free to help you get started! So what is this wallet? Get a few doges in your wallet! 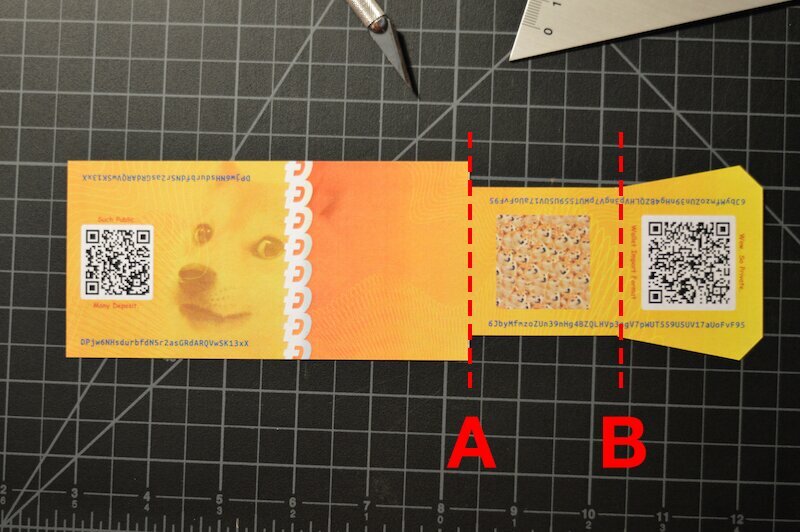 To receive doges, you must know your dogecoin address. Click the "Much Receive" button. 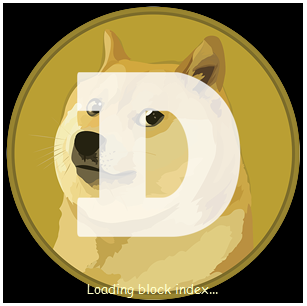 Right-click on your first Dogecoin address and choose "Copy address", or click an address then click the "Copy Address" button at the bottom. Addresses are CaSe SeNsiTiVe. Copy them. Do not type them. Faucets (or "water bowls") are sites that give out free doges. Visit some of the sites below and paste in your Dogecoin address. Sometimes the water bowls run dry and there are no dogecoins left in them. Just try another. To receive Dogecoin from someone else, simply send them a Dogecoin address. You can make as many addresses as you like. Dogecoin is the #1 social media crypto currency. You can receive Dogecoins on Reddit, Twitter, 4chan, and more are coming! So how do you import a paper wallet to your Dogecoin client? 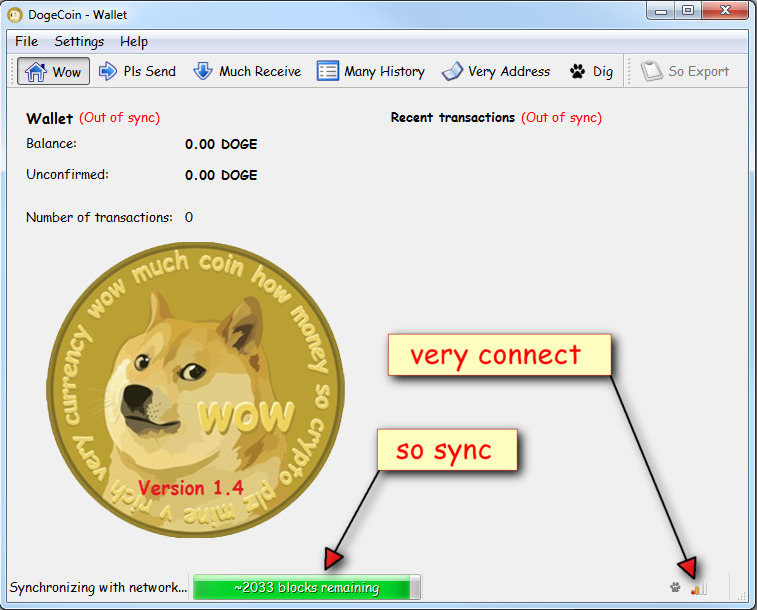 To be able to import a wallet to your Dogecoin client is an important feature. 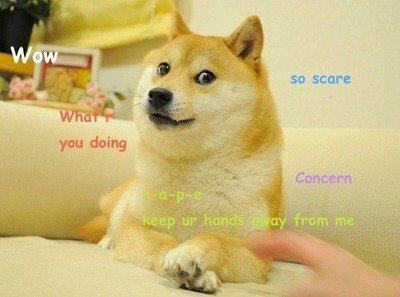 When you import a wallet you access the dogecoins that are on that wallet. Maybe someone has given you a paperwallet. To get the Dogecoins on that wallet you need to import them! Look for the private key on the paperwallet. This is usually hidden in someway. Go to Help -> Debug -> Console. 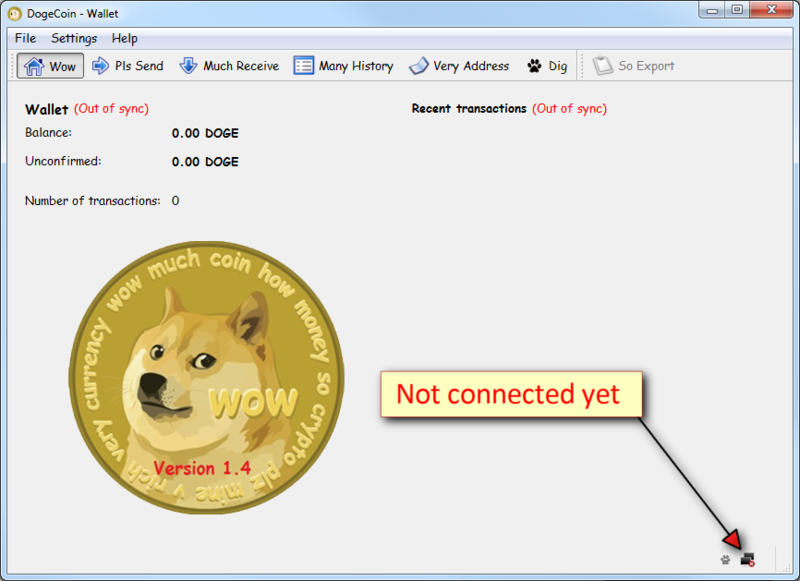 [optional step] A good step at this point is to transfer the dogecoins to a different wallet. This is because the person who handed you the wallet might still have the private key and can there for still access the doges. What does a paper wallet look like? This is a version of a paper wallet. To access the private key you have to unfold the folded part. So how do you make your own paperwallet? 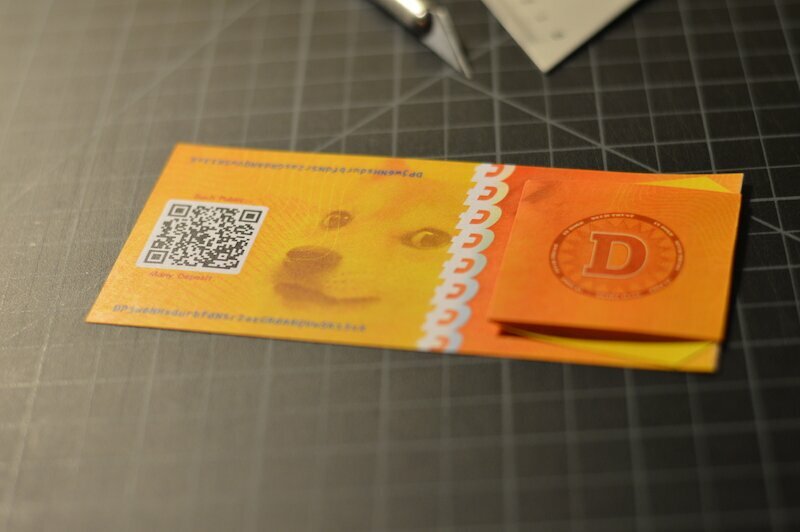 Making a paperwallet is very good if you want to spread the word or pay with dogecoins. A paperwallet is built up with two different keys, a private and a public key. The private key is the one you use to get the dogecoins, and it is usually hidden within the wallet. The first step to print out a paperwallet is to go to . There are two sides you need to print out. A front and a back. The front contains the two keys. To print the front you first click on the button that says "Random-generate new keys". This gives you two completely unique keys. After this you have to press the green butto that says "Print Wallet Front". This opens a printerwindow. Click print and your front should start being printed. After you have printed the front you need to print the back. Use the same sheet of paper to print the back to get the wallet to line up. Press the green button and print the back! What you should now have in your hand is a piece of paper with a wallet printed on it. Next step is to Cut, Fold, Seal and Fund the wallet. Cut out the wallet along the dotted line on the front! Now it is time to fold the wallet. Fold the wallet along the two dotted lines displayed on the picture below. Seal the wallet by putting two pieces of sturdy light-blocking tape on the top and buttom of the folded private key. Next step is to fund the wallet! 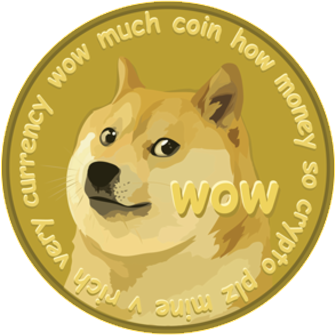 You do this by sending dogecoins to the public key using either the address or the QR-code. Last and probably the most important step of making a paperwallet is to use it! Give it as a tip in a restaurant, give it to a friend or maybe give it out to strangers you meet? USE IT TO SPREAD THE WORD OF DOGECOINS! So what does this wallet look like? 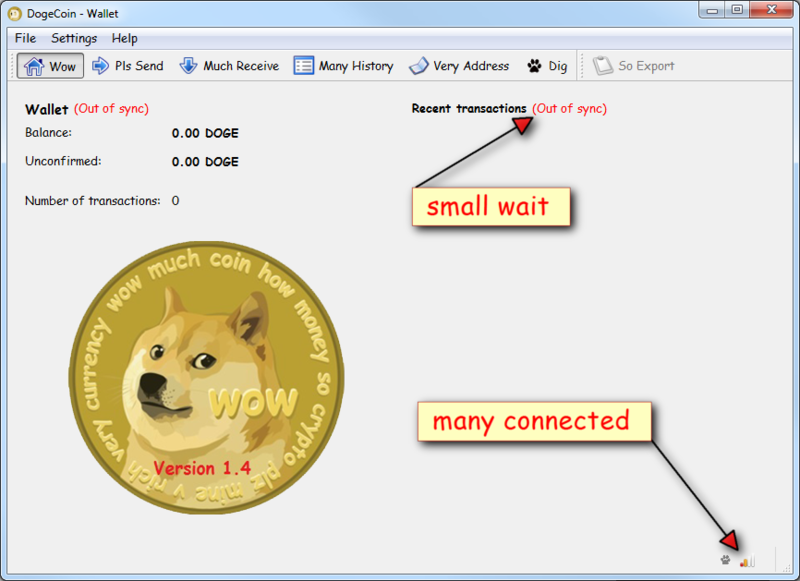 Now, your Windows Explorer might look a bit different, but just look for that "Dogecoin-qt". That's what you want! 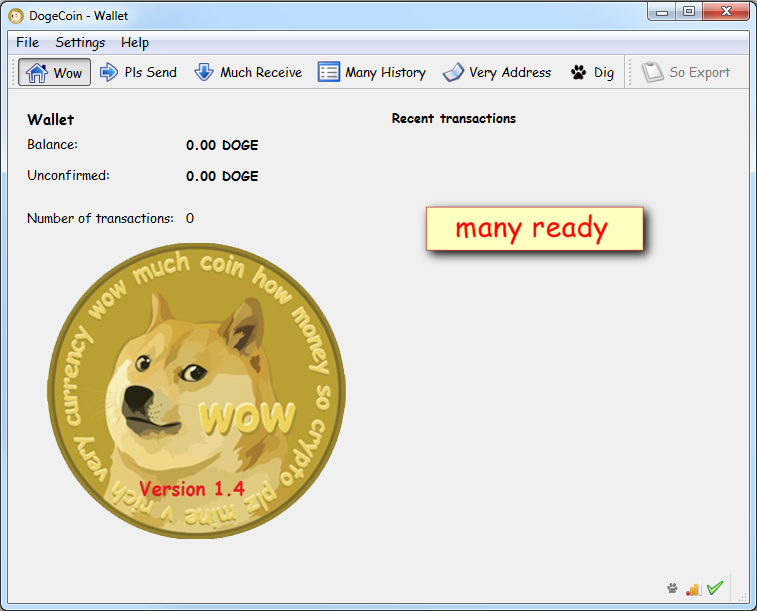 Double-click that to run your Dogecoin program and create your Dogecoin wallet. The splash screen will come up for a few moments. You'll see the green bar progress as your Dogecoin program syncs with the network. It can take some time depending on your Internet connection speed. Once you're sync'd, you might see an "Out of sync" message for a bit. Relax. Doge will be good. You can use your first address before this point, but you might feel more comfortable once you reach this point. At this point, you have completely sync'd with the network and you are 100% good as gold to go. That's it! You're good! You've got your wallet 110% up and running! Time to get some DOGE!